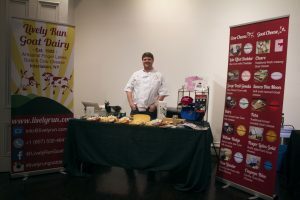 On Saturday December 10th Lively Run attended a wonderful event organized by the Cheese & Dairy Society of New York called the Great Northeast Cheese & Dairy Fest in Flushing, New York City. 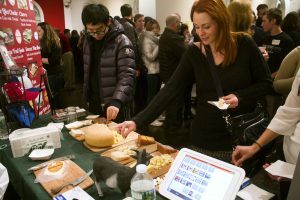 The event was attended by several cheese producers, beverage makers, and chefs. 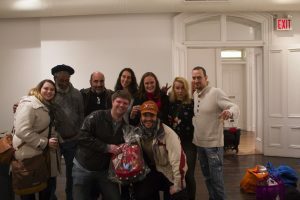 After experiencing some of the AMAZING Chinese food Flushing is famous for, Peter and Luca, representing Lively Run, went to set up their booth at the Flushing Town Hall. Around 5pm doors opened, everyone had a great time as hundreds of cheesavores descended from all over the northeast to come and experience some of the best our region has to offer. Pete and Luca said the crowd was as lively as our goats; all were very enthusiastic about the products on display at this wonderful event! Throughout the event the attendees got to vote for their favorite attending business. It is our pleasure to announce that Lively Run Dairy won the People’s Choice Award at the Great Northeast Cheese & Dairy Fest! 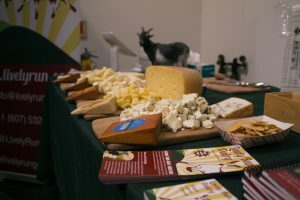 A huge thank you to Nicole Day Gray, Joe DiStefano, the Cheese and Dairy Society of New York State, Agriforaging and New York Epicurean Events. You guys did a great job and put on an awesome show!